With a fairly aggressive focus on dealing burn damage, for some reason. A “Cubic” Deck that features “Speedburst Dragon” from “Savage Strike”. “Crimson Nova the Dark Cubic Lord”, with its effect to inflict 3000 damage during your End Phase, if you have “Speedburst Dragon” in your hand, allows you to use its first effect to inflict 3000 damage. “Crimson Nova the Dark Cubic Lord” can be added from your Deck to your hand with “Cubic Karma”, which in turn can be sent to the GY with “Duza the Meteor Cubic Vessel” or “Foolish Burial Goods”. Also, since this Deck barely fights with the Extra Deck, you can use “Pot of Indulgence”. By using “Pot of Indulgence” to add cards to your hand, you’ll be able to aim at assembling the 3 different “Cubic” cards you need to Special Summon “Crimson Nova the Dark Cubic Lord”. A FIRE Effect Damage Deck that makes use of “Child’s Play” from “Savage Strike”. The first effect of “Child’s Play” is whenever your opponent Summons, you gain LP, which you can make use of to inflict Effect Damage with “Fire Princess”. You can Special Summon “Fire Princess” from the Deck with the likes of “Summoner Monk”, and even add it from the Deck with the 2nd effect of “Hiita the Blazing Fire Charmer”. And if your LP is 10000 or more, the 2nd effect of “Child’s Play” ensures your monsters cannot be destroyed by battle, allowing you to aim for further effect damage. Also, since “Child’s Play” or “Blaze Accelerator” are Continuous Spell Cards, you can have “Number 82: Heartlandraco” be unable to be targeted by an attack by your opponent. Also, you’ll be able to directly attack your opponent with the effect of “Number 82: Heartlandraco”. “Cataclysmic Scorching Sunburner” can be added from the Deck to the hand with the 2nd effect of “Hiita the Fire Charmer, Ablaze”. Also, since “Cataclysmic Scorching Sunburner” is a FIRE monster with 200 DEF, it can be Special Summoned from the GY with the effect of “Rekindling” In that case, it’s explosive as you can Special Summon multiple “Laval” monsters with 200 DEF. Besides the “Laval” monsters, “Totem Five” is a FIRE monster with 200 DEF, and if you Special Summon up to 5 monsters from the GY with the effect of “Rekindling”, including “Totem Five”, you can destroy all of your opponent’s cards and inflict 500 damage for each destroyed. A “Prank-Kids” Deck that makes use of “Pranki-Kids Rocksies” from “Savage Strike”. “Prank-Kids Rocksies” is an EARTH monster, so with the WIND, WATER and FIRE “Prank-Kids” monsters, you’ll be able to fulfill the conditions of activating “Fuh-Rin-Ka-Zan”. The “Prank-Kids” cards banished by the effect of “Prank-Kids Rocksies” can be used as Materials for Fusion Summoning “Prank-Kids House Battle Butler”. Also, since the first effect of “Prank-Kids Doodle” adds “Prank-Kids” Continuous Spells and Traps to your hand, you can Tribute them instead of monsters to Tribute Summon “Metaltron XII, the True Dracombatant”. A Beast Deck featuring “Aloof Lupine” from “Savage Strike”. The First Effect of “Aloof Lupine” banishes “Dark Desertapir” from your Deck, you can use the effect of the banished “Dark Desertapir” to Special Summon a Level 4 or lower Beast monster from your GY. Also, by banishing a Beast monster from your hand with the effect of “Unicorn Beacon”, you can Special Summon it, allowing you to rapidly assemble monsters on the field. At this time, the second effect of “Aloof Lupine” adds the banished “Dark Desertapir” to your hand, so the effect of “Unicorn Beacon” allows you to banish “Dark Desertapir” from your hand to use its effect again. “Madolche Hootcake” can banish “Dark Desertapir” from your GY to Special Summon another “Madolche” Beast monster from your Deck, creating good synergy. A “Litmus Doom Swordsman” Deck that uses “Impcantation” cards from “Savage Strike”. With the effect of “Impcantation” Monsters, you can assemble the cards needed to Ritual summon “Litmus Doom Swordsman”. And if there are 2 “Impcantation” monsters assembled on the field, you can Tribute Summon cards like “Zaborg the Mega Monarch” or “World Legacy – “World Armor””. For example, with “Zaborg the Mega Monarch”, if Tributed with LIGHT “Impcantation” monsters, you can send monsters from your opponent’s Extra Deck to the GY, while sending “Herald of the Arc Light” from your own Extra Deck to the GY, which is incredibly strong. In the case of “World Legacy – “World Armor””, its effect can add Continuous Trap “World Legacy” Cards from the Extra Deck to the hand, ensuring your “Litmus Doom Swordsman” gains 3000 ATK and DEF, while allowing you to return to the hand a face-up monster on the opponent’s field that was Special Summoned from the Extra Deck. A “X-Saber” Deck that uses Psychic Monsters that debuted in “Savage Strike”. By bringing out Level 3 “X-Saber” monsters to the field, you can Special Summon “Psychic Wheelder” or “Psychic Tracker”. Since “Psychic Wheelder” and “Psychic Tracker” are Level 3 EARTH monsters, they can be used as materials for “Goyo Guardian” or “Naturia Barkion”, as well as Xyz Material for “M-X-Saber Invoker”. And by combining “X-Saber” monsters with Link Monsters, you’ll be able to fill the field with multiple “X-Saber” Synchro Monsters. A Deck that combines the “Metaphys” with “Gren Maju Da Eiza” as well as making use of “Aloof Lupine” and “Pot of Extravagance”. By banishing a large number of cards, you can substantially increase the ATK of “Gren Maju Da Eiza”. Since you’ll be banishing so many cards, it’s worthwhile to use “Soul Absorption” to gain LP, allowing you to fight with cards like “Cynet Storm”, “Cosmic Cyclone” or “Blazing Mirror Force” that require huge chunks of LP. Also, since cards that banish allow you to bringing out “Metaphys” monsters, it’s good to include them as well. 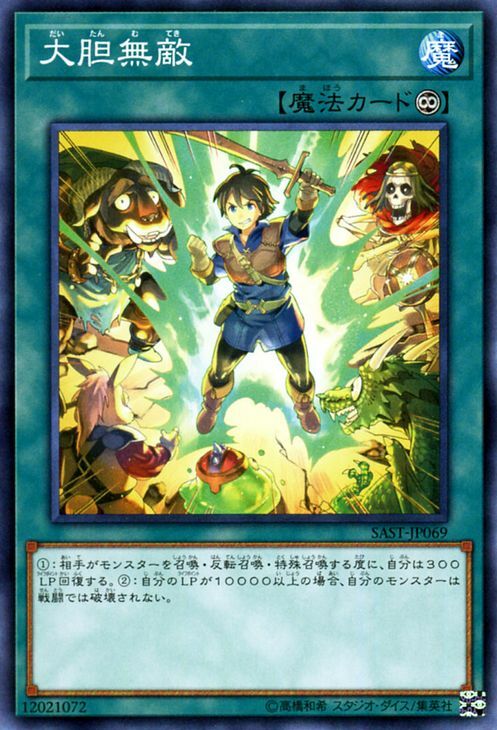 A “Masked Beast Des Gardius” Deck that makes use of Trap Cards included in “Savage Strike”. “Masked Beast Des Gardius”, if it’s sent from the field to the GY can equip an opponent’s monster with “Mask of Remnants”, and that “Mask of Remnants” allows you to to take control of an opponent’s monster with that effect. Thus, it works well if you do things like, using “Masked Beast Des Gardius” as Link Material, destroy it after sending it to the opponent’s field with “Creature Swap” et al, or sending it to the GY as a cost of activating “Dark Factory of More Production”. “Dark Factory of More Production” works well even if you send monsters you took control of from your opponent to the GY. Also, since “Masked Beast Des Gardius” is a Special Summon monster, you can Special Summon it back from the GY with the effect of “The Witching Hour is Nigh”. A Deck that deploys Normal Monsters that utilizes “Guardragon” cards from “Savage Strike”. By banishing Spell Cards from the GY with the effect of “Treasure Panda”, you can Special Summon the Level 2 “Guardragon Justicia” or the Level 1 “Flamvell Guard”. Since the Deck uses many Spell Cards, you’ll want to acquire the needed Spell Cards in the GY to activate the monster effect of “Treasure Panda”. Also, since there are many Draw related cards, you’ll be able to get “Treasure Panda” to your hand, but you’ll also be able to Special Summon it with “Summoner Monk” even if you don’t draw it.